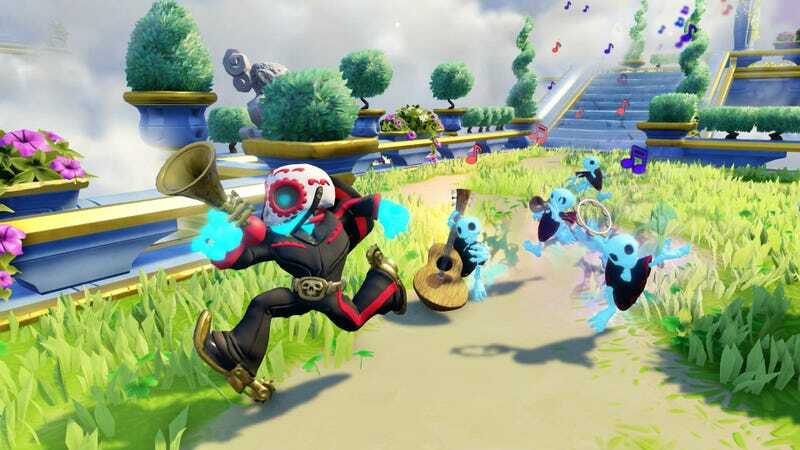 With attacks that spawn adorable skeletal bandmates and a ride that was once his coffin-shaped kids bed, Skylanders: Superchargers Fiesta is an unliving, unbreathing example of why I love this stupid series. The creativity of the toy designs is one of the key reasons I keep coming back to Skylanders year after year, and second-greatest weapon Activision has in the war against almost every body else making toy games these days. Yes, he’s a Dia De Muertos style skeleton in a racing outfit, but what does he do? Give me a toy shaped like Luke Skywalker or Yoda and I know where I stand. Discovering what this guy here can do is a little bit more of an adventure. Fiesta is all about music and celebrating life through the careful application of death. He’s my hero. As for why he does it, well Activision has an explanation for that as well. I wasn’t aware one could be recruited into the Skylanders. Can I be recruited into the Skylanders? Of course this is Skylanders: Superchargers, and as I explained in my initial impressions piece, that means each new character is paired off with a vehicle. In Fiesta’s case, it’s his childhood coffin-shaped race car bed, Crypt Crusher. That’s Crypt Crusher’s toy form. Note the moving wheels. Note the moving wheels that will cause my children to run off with this one so I can never find it again. As with every vehicle in the game, pairing it with its assigned rider gives it a bit of a boost, SuperCharging it, as it were. With Fiesta, Crypt Crusher takes on musical aspects and gains some additional riders. Fiesta and Crypt Crusher are two characters that will be playable on the E3 2015 show floor, along with some similarly unique friends and their rides. It’s almost enough to make me wish I was sweating my way through downtown Los Angeles and not sitting in an air conditioned home office eating sausage biscuits down the hall from my very own bathroom. Skylanders: Superchargers arrives everywhere this fall. Expect more on the game as E3 2015 continues.